Sea level rise will be felt both through changes in mean sea level, and, perhaps more importantly, through changes in extreme sea level events. Even if there are no changes in extreme weather conditions (for example, increases in tropical cyclone intensity), sea level rise will result in extreme sea levels of a given value being exceeded more frequently. This change in the frequency of extreme events has already been observed at many locations. The increase in frequency of extreme events will depend on local conditions, but events that currently occur once every 100 years could occur as frequently as once every few years by 2100. Global Mean Sea Level increased by 210mm between 1880 and 2009, and is continuing to rise at a fairly steady rate of just over 3mm/year. This rate of rise is undoubtedly contributing to the flooding problems of low-lying island states like Tuvalu, Kiribati and the Maldives. This is exacerbated in some areas (e.g. Gippsland, Victoria and the Gulf coast of the U.S.) where large-scale land subsidence causes a rate of rise relative to the land which is substantially higher. Correspondingly, some areas have seen less impact because they are rising. Australia is rising at about 0.3-0.4mm/year due to Glacial Isostatic Adjustment (GIA), but is still starting to feel the effects. In addition, the continuing rise in mean level causes a corresponding increase in the frequency of extreme events, as detailed on the next page. Even without the increase in the frequency of extreme events, millions of people will be impacted by the direct effects of sea level rise over the next century as summarised in the next figure. Note that rises of .54 to .75 metres by the 2090s are well within the range of IPCC projections. The large changes in sea level over the last few ice ages are sometimes used to dismiss the importance of the relatively small current changes in sea level, on the grounds (apparently) that mankind adapted to these changes in the past, so it should be able to adapt again. The obvious fallacy in this argument is that, previously, the inhabitants of a region would have picked up all of their worldy goods and gone somewhere more suitable when changes of sea level made their current habitat untenable. With the massive infrastructure (e.g. London and New York) that we have near sea level and the many millions of people living in threatened regions (e.g. Bangla Desh and southern Vietnam), such a solution is not available. The lines represent IPCC Special Report on Emissions Scenarios (SRES) based on different world views. 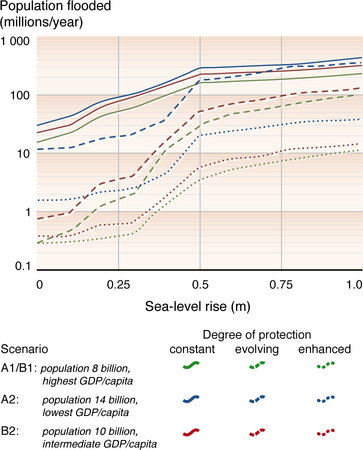 The differences in impacts between the SRES scenarios for the same amount of sea level rise and protection response reflect differences in exposure (population) and ability to adapt (wealth). The solid lines represent a level of 'constant' (no additional) protection response. The dashed and dotted lines represent the addition of protection response to different degrees.